It appears you can scratch Louisville and Oklahoma off Mitch Mustain's list. The quarterback, who earlier this week was given his release by Arkansas, was told Thursday by Cardinals coach Steve Kragthorpe that he wasn't welcome. 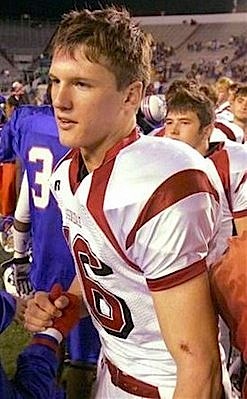 "Due to widespread media speculation, the University of Louisville is not interested in recruiting Mitch Mustain," Kragthorpe said. And a report out of Norman said Oklahoma had closed the door on Mustain becoming a Sooner. That leaves Tulsa, where Gus Malzahn resides. Malzahn, of course, was Mustain's high school coach and the two were together for one year at Arkansas before Malzahn left earlier this week to become an assistant with the Golden Hurricane. Wendell Barnhouse of the Fort Worth Star-Telegram reports on the chaos in Fayetteville, including an advertisement in Thursday's Arkansas Democrat Gazette that called for the resignation of Razorback coach Houston Nutt and athletic director Frank Broyles. Sometimes it's emberassing to be a Razorback fan. Well, make that, most of the time.